This past weekend was the international Super Smash Bros. tournament known as Pound 2016. There, in the stacked, 500-man bracket for Smash Bros. for Nintendo 3DS & Wii U, a Mewtwo took home the gold for the first time ever at a major event. To a Mewtwo player such as myself, this is undoubtedly the most significant result thus far in the history of the game. 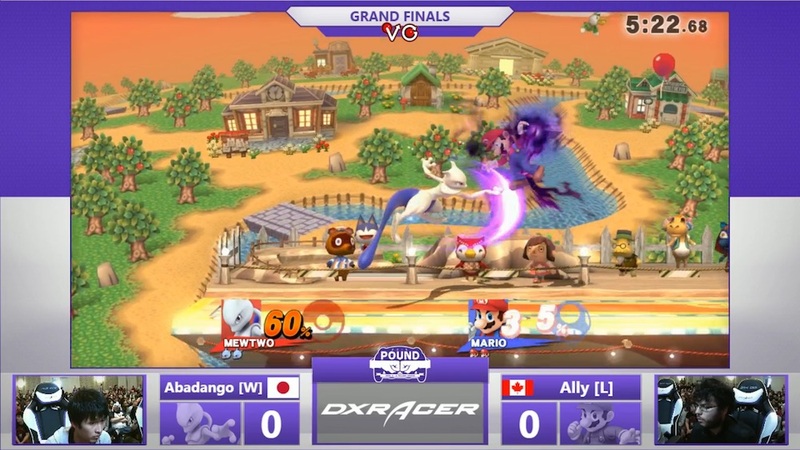 The player behind Mewtwo was Abadango, who at this point is a well-known name in the Smash 4 competitive community. He’s used a great number of characters throughout the life of Smash 4, and whether it’s been his creative Pac-Man, his dangerous Wario, his punishing Meta Knight, or now his Mewtwo, Abadango’s play turns heads. As someone who values deadly powerful combos and setups, the recent litany of improvements to Mewtwo have made the character an enticing choice for Abadango, though he has also expressed concern on his stream over its unforgiving nature. Nevertheless, Mewtwo’s worked out for him. Cutting through a sea of difficult opponents including VoiD’s Sheik and Ally’s Mario, Abadango made Mewtwo look deceptively simple, but anyone who knows the character is well aware that Mewtwo is anything but. Mewtwo’s history in Smash 4 is a wild one. Designed from Day 1 to be a “glass cannon,” a character that is strong offensively but light and easy to KO, Mewtwo has benefited both from dedicated players pushing the character forward (such as LoF Blue, Mew^2, Killer Jawz, Rich Brown, and The Reflex Wonder) and from the “hand of God,” as the Genetic Pokemon might be the most buffed character in Smash 4. Mewtwo is now faster, hits more reliably, combos better, and more. The number of improvements that have been bestowed upon Mewtwo are nothing small, though it’s worth pointing out that among many fans of Smash for the past three months (since the buffs started happening) that people still doubted Mewtwo’s prowess. How could Mewtwo possibly be truly good, when the character is still very large, extremely light, and easy to juggle? The answer is, with an amazing versatile kit that allows Mewtwo to exert pressure at almost every point during the game. Even in its darkest days, I never believed Mewtwo was truly a terrible character. Due to the unforgiving nature of its design (second lightest character in the game), Mewtwo makes you feel terrible for your mistakes. One wrong move and you can end up questioning your own existence. A Mewtwo played to perfection would still have been a force to be reckoned with even before the patches, but reaching that point and maintaining it was easier said than done. Now, I believe that a sub-optimal Mewtwo is still going to feel the sting of their mistakes (only Mewtwo now has more tools to avoid those mistakes in the first place), while a refined Mewtwo is easily high or even top tier. The fact that the top Mewtwo players present such a range of play styles—aggressive, defensive, technical, slippery, mind game-oriented—shows just how much potential the current Mewtwo holds. That said, I think that the biggest change to Mewtwo that has come with the improvements both in the players and in the character is that Mewtwo now has access to a powerful ingredient that it lacked previously: fear. At first, Mewtwo could not instill fear in opponents, and that meant Mewtwo was always on the back foot because of how easy the character is to KO. Now, things are different. It’s not just any fear, however, but more of a fear that’s mixed with the sweet scent of opportunity. When you fight Mewtwo, and you’re on your last stock while Mewtwo has a 60% lead, you’re aware of how good Mewtwo is at dealing damage and sealing stocks. The temptation is there, but so is the terror. Case in point, in an interview after winning the weekly tournament Wii Bear B-airs, LoF Blue mentioned that he switched from Sonic the Hedgehog to Mewtwo because the threat of Mewtwo’s myriad kill options forces the opponent to play differently at key moments. A similar pressure is also placed onto the Mewtwo players, who are aware of how fragile their character is. If you’re down as Mewtwo it’s possible to make it back, and all you need to do is to not get hit, ever. A good Mewtwo draws strength from this tension, from teasing that glimmer of hope while still emanating a threatening aura. If you’ve decided to pick up Mewtwo after Abadango’s win, I have one piece of advice for you: Be prepared to cry into your oatmeal as you die at 65% off of one critical mistake. Half the battle is a mental one. You have to maintain your composure as you’re getting bodied, or else the psychological damage you take just gets worse and worse. If you still stick with the character even after all that abuse (or maybe you’re kind of a masochist), then you’ll find a strong ally. This entry was posted in smash bros, video games and tagged abadango, mewtwo, pound 2016, smash 4, wii u. Bookmark the permalink.